New Hondas for Tokyo motor show | What Car? Honda has released details of three new cars appearing at the Tokyo motor show in October. Closest to production is the sleek-looking CR-Z petrol-electric hybrid which, although billed as a concept car, is likely to appear on UK roads by next summer. 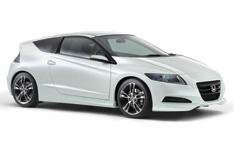 A spiritual successor to the CR-X, the CR-Z is pitched by Honda as the world's first sports hybrid. Similar in proportions to a Ford Fiesta, Honda promises it will be fun to drive. Although Honda has confirmed that it will use a six-speed manual gearbox, other details and performance figures have yet been released. While it won't need to be blisteringly quick to be fun, a certain level of performance is needed, so it's likely to use a 1.5-litre petrol engine rather than the 1.3-litre unit in the Insight. Expect to pay from around 16,000. Next up is the six-seat Skydeck MPV concept car. Its Lamborghini-style front scissor doors would certainly help in tight multi-story car park spaces, but they're rather more unlikely to make it to production than the rear sliding doors. It will also be interesting to see if Honda decides to adopt the Skydeck's three rows of seats over the current FR-V's unusual two rows of three. The Skydeck is another hybrid, the main components of which are housed in a tunnel that runs the length of the car, like the fuel cell found in the FCX Clarity. Finally, there's the EV-N, a tiny four-seat battery-powered car around the same size as a Toyota iQ. It draws inspiration from the company's minute N360 360cc car that was built in the 1960s. A neat touch comes in the form of solar panels in the roof to top-up the battery. The EV-N also features car-to-car communication technology that will eventually help to reduce congestion and accidents in the future.